The Roman poet Catullus condemned Caesar’s “wicked generosity” because it ultimately led to the downfall of the Roman Republic. 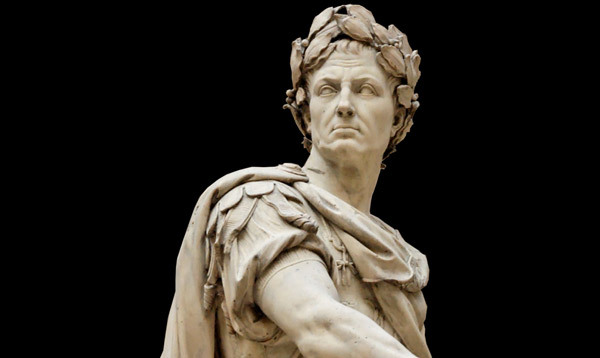 Caesar’s generosity corrupted public institutions as he took from the public purse to purchase favors and status. But many of his contemporaries did not question the authenticity of his giving. He was perceived to be heroically magnanimous. And it is in the perception of generosity where the dark side of giving manifests itself. We can argue which actions are truly generous, whether they meet our standard based on their intent or their impact, but if the actions in question elicit the perception that they are generous, they have shown their power. That giving can have a negative impact is a prominent topic not only in our school’s seminars but also among our leading foundations. Edgar Villanueva, a long-time foundation professional, seeks to help us overcome what he sees as the oppressive structures shared by finance and philanthropy in his fast-selling book titled Decolonizing Wealth. Generosity has the potential to be “wicked” at the kind of grand scale we see with Julius Caesar and in sustaining large unjust structures of privilege. There is also the ever-present temptation to use publicly subsidized charitable dollars for private gain as has again become evident in recent foundation cases discussed by our Suzanne Garment and Les Lenkowsky. But there is plenty of room for manipulative giving in small scale, everyday interactions. Professors Fisman and Luca argue in The Atlantic that even very small gifts create very real obligations of reciprocity that affect the decisions of highly sophisticated recipients. They examine how small tokens influence the prescription writing behavior of physicians, which is why they wonder if free pens distributed by drug salespersons caused the opioid crisis. Reciprocity elicited by gifts is so strong and dependable that strategies for using them are part of business school curricula. In sales and in fundraising, nominal gifts like labels and postcards are used in direct marketing campaigns because they work—they boost financial returns. In the normal course of our social interactions, we do not make much of such mixed motives, knowing that a business gift or a token of appreciation for our charitable gift constitutes part of a more or less established set of norms. In a business context, we know that a gift serves to advance a commercial relationship. And in a fundraising context, gestures that recognize donors with benefits ranging from mugs to names on buildings are well established practices. We know that thanking donors is the right thing to do and that it increases the chances that they will give again. How we express appreciation for our donors or customers may become problematic and in need of reform, but in the normal course of such activities, we would rarely consider them wicked. We do create rules that restrict gifts to public officials to guard against corruption. We have developed layers of protections to prevent abuse. These days we rightly worry about our public institutions’ capacities to withstand the lure of our contemporary Caesars, but the potential for manipulation through smaller, distributed giving should also cause worry. Many decisions about our public life take place under the radar we use to detect public manipulations of Caesarian wickedness. We are increasingly learning that social media and digital devices are designed to generate stimuli that keep us feverishly engaged with a product or service, often in order to generate profits for the provider. In part, it is the lure of the free or seemingly free convenience that entices us. The potential to scale connections, friends, and transactions of all kinds makes it seem as if we are receiving so much value and ease through the digital extensions of ourselves. But this gifted ease and convenience also makes us vulnerable to manipulation, frequently triggering our impulse to reciprocate. This kind of intimate manipulation at scale used to be more difficult to pull off. Before mass media, dictators had limited reach, and even when they dramatically expanded their audiences through radio and television, they were still apart from our communal cultures where intimate contact had a way of unmasking inauthentic gestures of generosity. Social media seems entirely more intrusive. It connects, embellishes, and intertwines with our closest relationships. We do not enter these intimate spaces ready to defend ourselves against manipulation. But as social media accompanies us into these places, we’ll need to adapt. It is, of course, not all bad news. The power of social media to do good should not be overlooked. We have seen great potential for generosity to thrive on top of digital platforms, most prominently perhaps with the #GivingTuesday movement that is largely driven by social media. And as we look to the future of engagement with philanthropy and causes and the transactions that will support them, we see a lot of innovation and energy migrating online. But as we tap into the power of generosity online to connect across spheres of intimacy, we should also beware how ill-prepared we are to guard against wicked generosity. Being a first-year college student hasn’t stopped Maren Lehman from accessing tools and resources to pursue her passion of educating people about the dangers and realities of eating disorders. The philanthropic studies major arrived on campus ready to pursue her passion to help others. The Whitley County, Indiana native had already been involved with youth philanthropy “pods” that volunteer and distribute grants to local organizations. Since high school, Lehman has known she wanted to major in philanthropy at IUPUI and she has jumped at the opportunity to be involved at the school in her first year. She represented the Lilly Family School of Philanthropy at IUPUI’s annual regatta, where she and four other students competed in a canoe race down the Indiana Central Canal in Indianapolis. 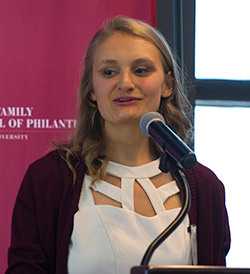 She became involved with the school’s Philanthropy Ambassadors Club, an organization that fosters networking, service, and fundraising for philanthropic studies students. Lehman has also taken steps to spread more awareness on campus about eating disorders, an issue that has affected her in the past and continues to do so today. “If I can help more girls or boys who have eating disorders, that would be great,” she said. She conducted several studies about eating disorders at IUPUI with her nutrition professor in the fall. So, she decided to take action. During a busy first semester, she heard of the David Nathan Meyerson Prize for Leadership and Giving Competition, which offers undergraduate students the opportunity to write an essay about a topic they’re passionate about. Five students are then chosen to compete in front of the school’s board members, staff, faculty, students, and family members. Two undergraduate students are chosen as winners, and they are awarded a scholarship to re-grant to a nonprofit of their choosing and the opportunity to travel to that nonprofit to learn more. Balancing a new life in college and Indianapolis, Lehman decided to wait a year before entering the competition. “I thought, ‘I’m just a freshman.’ I’ll let others with more experience do it first,” she explained. With encouragement from Pamela Clark, director of student services and admissions, Lehman changed her mind and decided to apply. Her topic? Her passion of eradicating eating disorders. During the competition, Lehman stated reasons why she believed her advocacy makes a difference, but how a partnership with a larger organization could do even more. “The National Eating Disorder Association (NEDA) in New York City works towards not only their vision of a world without eating disorders, but mine as well,” she said. Stating surprise upon hearing that she won, Lehman already began thinking about ways to collaborate with a fellow student passionate about ending eating disorders. She hopes to travel to NEDA during the summer to learn more about the mental health aspect of eating disorders and how she can work with the organization to advocate and do more. While B.A. student Natalie Laskowski only began her journey as a major last January, she’s already taken advantage of the opportunities that have come her way. The Indianapolis native originally studied pre-law at Ball State University, but after volunteering with Dance Marathon there and serving as the vice president of philanthropy and community service for the Panhellenic Council, Laskowski found herself drawn to philanthropy and fundraising. After taking a gap year, participating in a mission trip to Haiti and interning at a Catholic higher education institution, she transferred to IUPUI and arrived at the Lilly Family School of Philanthropy. “I knew that the staff and faculty at the school could help cultivate my passion for fundraising and propel me on a pathway of philanthropic success,” she explained. While she’s had multiple internships in the nonprofit sector, Laskowski knew she had to fulfill the internship requirement with the school. So, she applied to an internship with Future Farmers of America (FFA), a nationwide organization with 8,630 chapters and over 665,000 members, whose headquarters are based in Indianapolis. 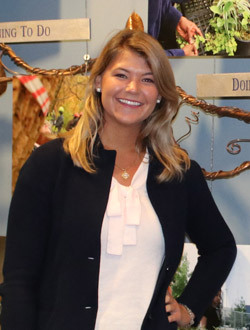 Laskowski began working with the FFA Foundation’s development and donor services team last summer, and has worked on annual fund data analysis, stewardship communications, endowment reporting, communications and marketing, prospect research, and corporate sponsorship engagement. “Working in these multiple areas has given me the time and space to consider what specialty in fundraising I would like to focus on in the future,” she said. After enjoying and learning from her experience over the summer, Laskowski was able to extend her internship through the fall. As a result, she worked with the entire team at FFA’s National Convention, which brought over 60,000 people to Indianapolis and featured speeches from the President of the United States and the U.S. Secretary of Agriculture. “Meeting students, donors, educators, and supporters from across the country was motivating and enlightening,” she said. Over the summer, Laskowski volunteered to serve on the team that reviewed grant applications for the FFA Living to Serve Grant and was able to see that grant awarded to one chapter at the national convention. “Serving on the grant committee and seeing that extraordinary chapter receive the grant reminded me why FFA is an integral part of the agricultural educational futures of students in the U.S.,” she explained. Laskowski’s experience interning with FFA has given her valuable insights not only into FFA’s key role as the future of agricultural education and leadership, but also into fundraising in general. 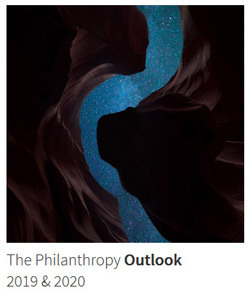 Last year, we spoke with Anna Pruitt, Ph.D., and Tessa Skidmore about the Philanthropy Outlook, a report by the Lilly Family School of Philanthropy presented by Marts & Lundy that predicts baseline measures of giving for the next two years. In order to account for tax policy changes passed at the end of 2017, the school’s research team restructured the report. Included was a new section on tax policy and a section focused on three various scenarios that could occur due to the combined effects of economic factors and tax policy changes. Fast forward one year, and Skidmore discussed the new report predicting giving in 2019 & 2020 (released last Wednesday), and how the research team continues to adapt it to best fit current economic realities. “We want to include the most up-to-date information and respond appropriately to changes in economic factors and tax policy,” Skidmore explained. As a result, the team decided to further strengthen the scenarios from last year and the projections of giving by individuals, foundations, corporations, and estates (sources of giving), and giving to education, health, and public-society benefit organizations (recipients of giving). To do so, they formed a partnership with the Wharton School of Business at the University of Pennsylvania. The Wharton School has produced research on the potential impact of the tax policy changes on the economy, including providing estimates on how much they think the number of itemizers will decrease. “So, we partnered with them by including some of their economic variables in the model. As a result, the model incorporates additional expertise in economic forecasting and tax policy changes in order to enhance the report as a whole,” Skidmore said. In addition, the research team was also able to utilize the partnership to include upper and lower bounds for the projections of giving by source and to recipients. Overall, the model predicts that giving will grow in 2019 and 2020. “Many economic indicators, such as measures of employment, wages, housing, and personal income, are continuing to be strong, even with uncertainty about the stock market,” Skidmore said. The Lilly Family School of Philanthropy’s study abroad program “Philanthropy in a Comparative European Perspective” asks students this question as they explore the similarities and differences between philanthropy in the United States, the Netherlands, and Germany. Pamala Wiepking, Ph.D., Visiting Stead Family Chair in International Philanthropy, visiting associate professor, and an internationally renowned expert in global and comparative philanthropy, will lead the program. She has specifically designed it to encourage interaction between Lilly Family School of Philanthropy students, European students studying philanthropy and nonprofits, and prominent renowned academic and professional philanthropy experts. Highlights from this year’s program will include visits to Dutch almshouses, local foundations, the Reichstag, and the Association of German Foundations, as well as lectures from renowned professors in both countries, and opportunities to volunteer at local nonprofits. 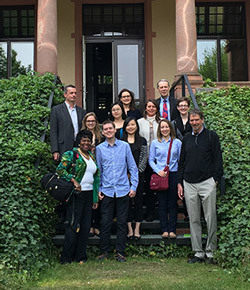 While the format of this program is new, in the past the school’s students who studied philanthropy in Germany remarked favorably on their experiences and the new insights they learned. Wiepking eagerly anticipates sharing the Dutch and German cultures of generosity with students from the Lilly Family School of Philanthropy. She especially looks forward to conversations about the understanding of the meaning of philanthropy between Lilly Family School of Philanthropy students and those in Germany and the Netherlands.